A Paint Horse injured in the tornadoes that tore through Central and Western Massachusetts last week has undergone surgery to remove wooden debris from his leg. Although a risk of infection persists, his clinicians at Tufts University’s Hospital for Large Animals are optimistic about his recovery.  The horse, attending veterinarians and affected family will be available at the Cummings School’s Hospital for Large Animals from 10:30am until noon on Tuesday. Cajun, the 9-year-old gelding owned by Joann Kass and Steven Bush, was one of four horses affected by the tornado, which leveled the family’s home in Brimfield, MA. Another horse died, and two others were treated for cuts and abrasions by Spencer veterinarian Paula Orcutt. Cajun was impaled by a finger-sized piece of wood that penetrated his right rear coffin joint and tendon sheath. Dr. Orcutt and Kass’ sister, Karen Walker of New Braintree, MA, worked with local firefighters to climb over debris and gain access to the stables after Wednesday’s deadly tornadoes. 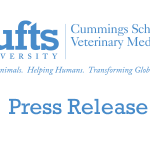 On Thursday, the pair, together with Kass and Bush and more than a dozen volunteers were able to clear the driveway of fallen trees to enable the Animal Rescue League of Boston to extract Cajun and transport him to Tufts in Grafton for emergency surgery. The nearly two-hour surgery went well, says Dr. Carl A. Kirker-Head, VetMB, MA, DACVS, DECVS, associate professor of Clinical Sciences at the Cummings School of Veterinary Medicine and Cajun’s surgeon at the Hospital for Large Animals. Any time the coffin joint and tendon sheath are involved, there is a serious risk of infection—and given the adverse conditions Cajun was in following the tornado, we are proceeding very cautiously, said Dr. Kirker-Head. He is receiving the best care available, and we are hopeful for his continued improvement. Cajun’s ongoing medical care is being supervised by Clinical Assistant Professor Thomas Jenei, DVM, DACVS, as well as residents, interns, veterinary technicians, and fourth-year veterinary students at the Cummings School. Orcutt has waived her fee for the on-site care, and drug distributor JA Webster has committed to reimbursing her and Brimfield’s Kevin Sherman, DVM for drugs they used for Cajun’s care. Non tax-deductable donations may be made to Joann Kass and Steven Bush, care of Karen Walker, 351 Bernard Whitney Road, New Braintree, MA 01531 or directly to Cajun’s care by contacting the Hospital for Large Animals.